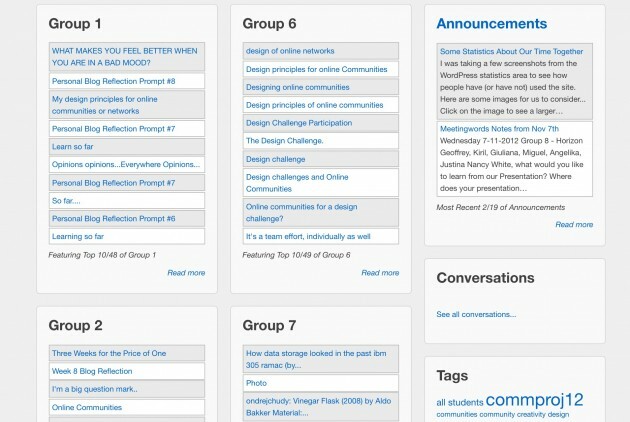 Project Community is a project, a community and a set of tools for using online communities and networks for enhancing the design process in any context. Nancy got me involved in 2012 because they had an interest in busting the course out of the LMS and into the world. This was the first syndication bus feed wordpress powered connected course set up I did after working on ds106, written up in 2013 as a Class Sized Syndication Bus. As we are now, the site was hosted on Reclaim Hosting (though in those days it was still Hippie Hosting). For Project Community, blogging was not strictly about learning to blog or make a digital identity as was ds106; the purpose here was for students to publicly journal and reflect on their work. My suggestion was to ask all students create sites on tumblr because (a) it’s easier and less to learn than WordPress or blogger; (b) It is amenable to mobile reading and writing; and (c) all those digital natives young people like it. It also made it easy to add their blogs to Feed WordPress since their entire site was devoted to the course material. Students worked in teams for their projects, so when collecting their blog address via a Google Form, they had to indicate which group their were in. So when I added a new site to FeedWordpress, I also categorized it with their group, letting us create front page group listings of the most recent posts in each group. This was what we did in 2012, 2013, and 2014 with 80-100+ students each year. Sydnicated posts were linked locally on the course site, so we could have all the comments be on the course site. These are all stand alone WordPress sites. I should really get my act together and lop them all in one multisite set up. There was a reason I skipped this, and the first two years, my archiving means was a bit tedious. But once we got the powerful Installatron on Reclaim Hosting (if your web hosting is no using it, GET OUT!) it makes cloning a full site a one click operation, so I just make a new site by cloning the last one, and then wiping out all the posts. In 2013 we focused the projects to having the project teams create strategies and ideas to support the work of real Non Governmental Organizations (NGOs), so they were learning to work with remotely located organizations, and ideally produce something to help them. In our planning for this year I suggested another strategy for the blogs. while tumblr is easy to use, I started thinking its not really as re-deployable skill to have. Many students struggled to get started. A lot of the feedback requirement lands on the tutors, and trying to read/respond to 20 blogs regularly is a big load. We planned this year of having the students take on different roles each week on their team, so they would get a mix of technical roles, communication roles, strategy roles. 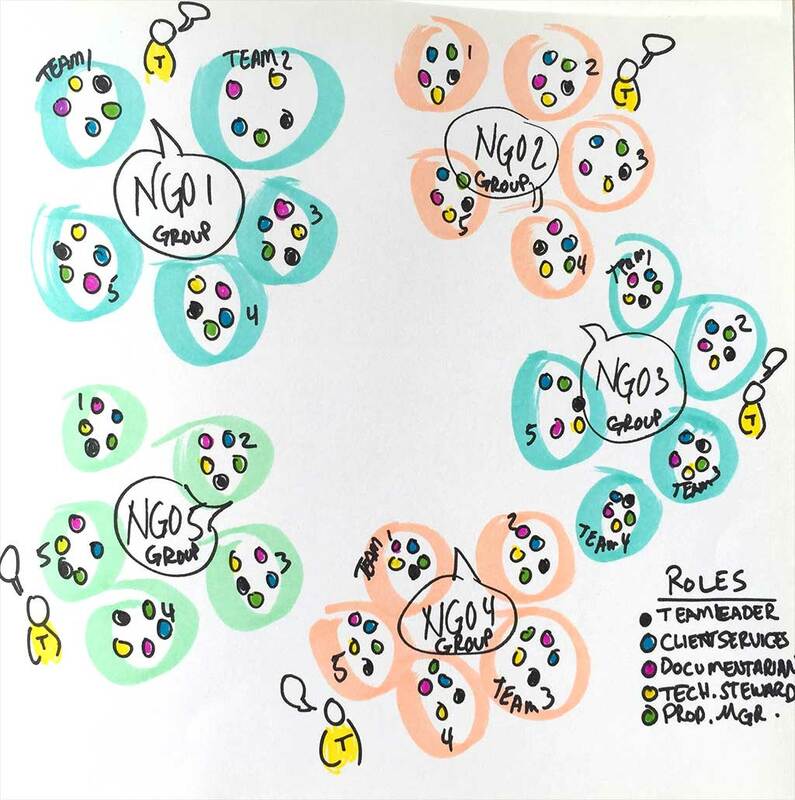 We have a structure of student teams of ~5 each, and there are 2-3 teams each working on a project for the same NGO. As they move into a production phase, they will then work more across teams, as it is the goal for each NGO to have 1 project done by students (where in the past one NGO might have to work with 3 different teams). My suggestion was then to have each team create a shared blog for everyone on their team, rather than have each student do their own blog. This way, the teams can be more accountable to each other. I also suggested we have them make their sites on WordPress.com– I can see having some basic knowledge of how WordPress works to be a more after course skill than using tumblr. I tested some things out with syndication by asking the faculty and tutors do some dog fooding and blog in a team faculty blog. Also, I suggested that in the first week when teams form, that they first create their own identity but picking a team name. Maybe it’s me, but I see a lot of value in a team being known as “5 Kings” or “SWAG” than just “Group 7”. So what I found out is that the author names from WordPress com come over in syndication as an author name there. So Caroline on The Ducks team has a URL for all of her work there which carries out as syndicated to the course site. Many of these first posts are introduction ones, and I brought over an activity I’ve used in the UdG Agora Project to ask people to create a meme image that shows their “superpower”. And because these are all WordPress sites, we have made it so comments live out on the blogs this year, because it is easy to syndicate them back in — e.g. the feed for the Tiny Houses in Transition team blog site https://foundintransitionblog.wordpress.com/ is just https://foundintransitionblog.wordpress.com/comments/feed, and so we can have a single list of all comment activity or all comments related to teams forking for the International Water Foundation. This new approach called for writing a bit more getting started help, a Blogging Guide which starts with an overview of the Team Blog Concept and some preliminary planning to do before setting up a site. Each team as a “technical steward” charged with setting up the blogs on WordPress.com. RESIST THE TEMPTATION to start trying to design the visual appearance, we will return to that later. Start with what may look like a plain and not very exciting blog. Think of this as a house we are building- before you start painting the walls… we need to have walls! We are going to build the architecture of your team blog first. In a few weeks we will return to its visual appearance. I then suggest setting up a preset list of categories, setting up menus, starting an About page, and suggesting sidebar widgets, the most important being the one that lists all the authors, for one thing to make it easy for tutors to review the work of specific students. I thought the list of set up tasks was a bit long, but the students did it easily. I had in less than 24 houses all 11 team blogs submitted to my google form (Having them in team blogs meant adding only 12 feeds to the site, instead of 60 individual ones). And i wrote a general set of guidelines for all authors (e.g. make interesting titles, use links, upload images, embed media, use featured images). The idea is as they start to work on their projects in a few weeks, that eventually I will give them some help in turning their sites from something that looks to bloggy, to be more of a project site– either by switching themes and/or replacing the front blog posts view with a static Page. In four days we have already 100 student published posts, and these are not just Hello World stuff. 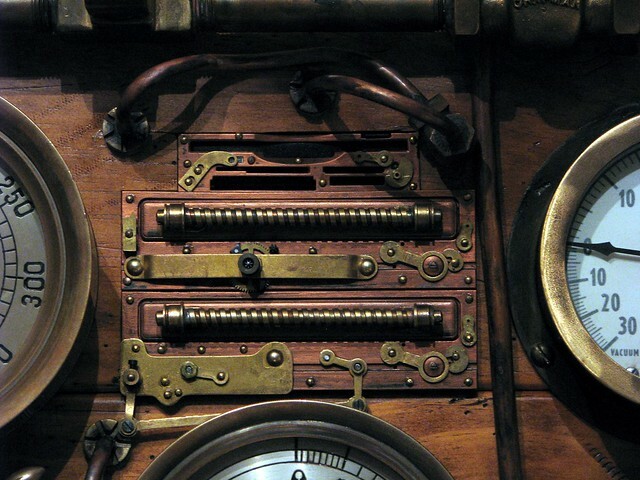 It’s the same machine… but then again, its all new inner workings. Top / Featured Image Credits: Derivative of flickr photo by floorvan http://flickr.com/photos/f7oor/564663403 shared under a Creative Commons (BY-SA) license, here shared and appreciated alike. I had someone reference the simplicity of the Tumblr interface the other day. It got me wondering about how hard it’d be to do something with the WP Dashboard that parallels the options that are already possible in the Screen Prefs you get on various other pages. I know you can hard-code it into themes but I want something a bit more flexible. Maybe it’s something that uses the Press This option in lieu of the dashboard . . . anyway something I’m thinking about and will play with once I free up some time. The progressive release model makes sense to me.